(Nanowerk Spotlight) Temperature differentials (heat) are ubiquitously present in our environment, making thermoelectric energy harvesting a highly attractive research field. The thermoelectric effect is the direct conversion of temperature difference to electric voltage – a phenomenon described by the Seebeck effect and measured by a Seebeck coefficient (volts per difference in temperature). Flexible thermoelectric generators that are capable of producing electricity out of a temperature difference – even on a single device – could have many applications in consumer and medical electronics. However, conventional thermoelectric materials are rigid and brittle and don't lend themselves to be used with flexible devices. 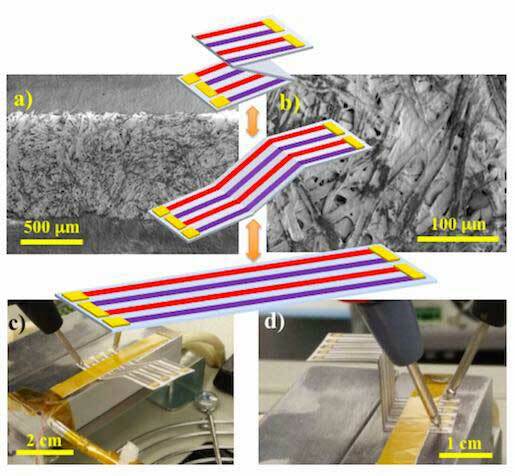 In a previous Nanowerk Spotlight we reported on the fabrication of thermoelectric paper devices that utilize waste heat to power electronics and sensors. In new work coming out of King Abdullah University of Science and Technology (KAUST), a team led by Muhammad Mustafa Hussain, an Associate Professor of Electrical Engineering, now demonstrates another paper-based thermoelectric device. "Our flexible paper-based devices can be easily stacked or efficiently folded and cut through origami and kirigami techniques so that it is possible to achieve higher power densities," Hussain tells Nanowerk. "This allows for enough electricity to be generated to supply low-power systems, especially in applications where flexibility is advantageous, such as robotics, cybernetics, wearable devices or bio-integrated systems." The team is reporting their findings in Nano Energy ("Paper-Based Origami Flexible and Foldable Thermoelectric Nanogenerator" – in press). To develop their affordable and efficient thermoelectric nanogenerators, the researchers used simple micromachining and microfabrication techniques to integrate inorganic materials with standard paper substrates. As active thermoelectric materials for their generators, they used bismuth telluride (Bi2Te3) and antimony telluride (Sb2Te3) – two well-known thermoelectric materials with high figures of merit that have been often used to implement efficient TEGs for an extensive range of applications. "Our devices can be implemented rapidly and, at the same time, exhibit flexibility and mechanical adaptability for a diverse set of scenarios ranging from vertical or horizontal schemes that can be conveniently used for various applications," explains Jhonathan Prieto Rojas, an assistant professor at King Fahd University of Petroleum & Minerals, and first author of the paper. "We used two kinds of papers, standard and polyester-based, to demonstrate foldable, flexible and affordable thermoelectric nanogenerators." The first nanogenerator implementation (on standard paper) presented a power of 0.5 nW at a temperature difference of 50 K, whereas an optimized second implementation (on a tearless, extra-smooth, polyester paper) achieved less internal resistance and a higher power generation (~80 nW) at a temperature difference of 75 K.
The researchers note that, mechanically, both thermoelectric films are stable on both paper substrates, showing some degradation in electric resistance after a compressive strain test or a cycling test, although due to the stiffer nature of polyester paper, the degradation can be more noticeable. They are confident that encapsulation and placement of the thermoelectric films in the neutral mechanical plane will help to reduce this effect. Apart from the devices' mechanical performance, the next steps will also address an improvement of the power generation by introducing novel nanomaterials and process optimization. "Additionally, improving the surface properties of the paper can help to improve performance and efficiency," says Hussain. "Finally, power density can be greatly enhanced through suitable origami/kirigami folding and cutting techniques."